“Kermit” was brought to Gulf World Marine Institute on May 9, 2018 from St. Joseph Peninsula State Park. 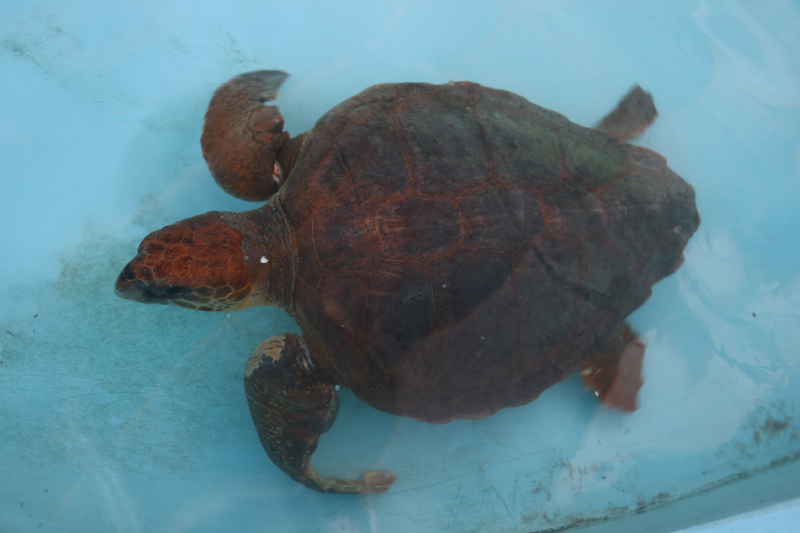 This loggerhead sea turtle was found by a fisherman with a severe entanglement around both front flippers. The entanglement consisted largely of discarded fishing line. The left front flipper was safely amputated in order to prevent any further damage. Kermit was named for the croak-like sound made when he/she grinds the top and bottom halves of the beak together. Even despite missing one flipper, the animal has regained its ability to swim and dive normally. The animal also regained a healthy appetite. Kermit was medically cleared and released on November 20th, 2018 at St. George Island!